This is a sequel to Jane Austen’s Emma, beginning around 18 months into the Knightley’s marriage and all is not well in Highbury. The story begins really quite depressingly; news of a death, and the realisation that Emma and Knightley are emotionally not very close – they have kept up their respective roles of spoiled child and advisor. The story then moves onto a bankruptcy and another death. I had to take a break from this book and come back to it, misery piles upon misery and through it all Emma and Knightley get further and further apart. At the end of ‘Emma’ I felt that Emma had matured somewhat and gained a better level of understanding but here the character has reverted to the clueless character of two years before. It is also disappointing to see Mr Knightley constantly pulling away from his wife, he is hardly ever there, and when he is he’s usually leaving! 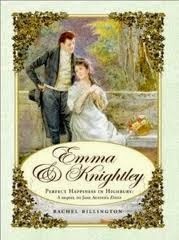 Since Mr Knightley provides Emma with so little friendship it is comprehendible that she wouldn’t confide in him but I don’t feel that would be in line with Emma’s character, I think in the circumstances in the story Emma would have felt obliged to tell him of certain events. There was also a reliance on the couple mistaking the other’s feelings in the same way that was cleared up in ‘Emma’ and I felt it was unlikely that they’d both do this again. Plus all this was cleared up in literally five pages, and there must have been so many opportunities for this to be cleared up much more quickly, it seemed unlikely to me that it would have dragged on for so long. There were some things I liked very much about this book; the style of the writing is really very good, it’s witty and ironic and it reminded me of the original book. Emma’s sister Isabella is a very minor character in ‘Emma’ and here she is fleshed out much more, which I thought was done really well. There are also some original characters, most notably Mrs Philomena Tidmarsh, who is an intelligent widow who befriends Emma for a mixture of reasons. However, despite all these positives, the sad subject matter and bad state of the relationship between Emma and Knightley, which I felt was unlikely, meant that I found this book hard going to read.